It all started one October afternoon last year. I was in the self checkout line in our local Home Depot and looked up at the security camera and saw the most haggard looking image staring back at me. I was appalled!!! The person that I saw in that image looked ten years older and grumpy. So... the hunt began, my vanity got the best of me. Should I get Botox? Is there really a miracle cream out there that will rid me of my old, tired looking skin? How do I fix this?!!? After a ton of research, I have finally discovered what I have found to provide me with the best results, hopefully the same results will occur for you! Advanced Dermatology products are by far the best. The package comes with a 90 day supply of a cleanser, two night creams and two day creams (you use the creams in conjunction with one another). You pay for the product monthly, which is a little spendy, but the results are guaranteed and the company will give you a full refund if you are not satisified. I honestly feel that my skin looks and feels a lot better since starting to use the product. 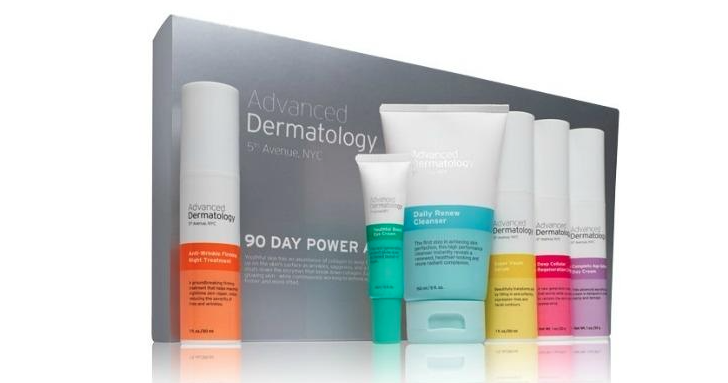 If you are interested in trying it out just go to www.advanceddermatology.com. 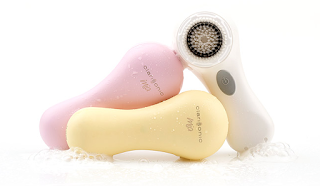 In addition to using Advanced Dermatology I have started to use the Clarsonic face brush. I was my face with mild soap, followed by a facial scrub, use Clarsonic, and follow up with the Advanced Dermatology cleanser. I will warn you, during the first couple of weeks of using the Clarsonic, your face may break out. Mine definitely did, but it's normal because all of the impurities that are deep within your skin are coming to the surface. Don't worry, it's only temporary and once your skin adjusts you will see and feel great results. Overall, I have learned that the older that I get, the more care I need to give to my skin. I think that I have found a great system for keeping my face looking as young as possible....I even got carded at a local restaurant this past weekend! That hasn't happened in a looooooonnnnnggggg time!! 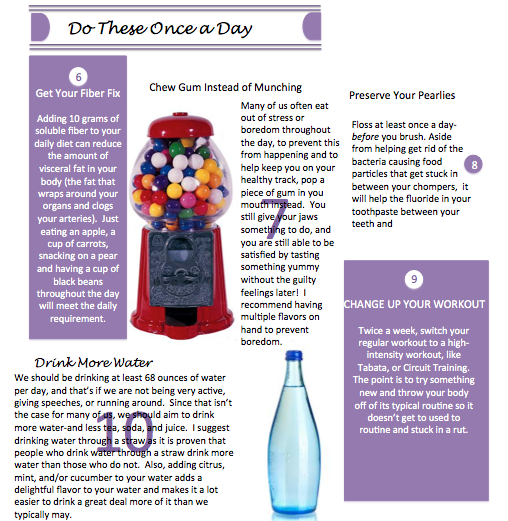 With spring peaking around the corner and bathing suit season trailing swiftly behind, here are a few more resolutions to help you through your spring cleaning and spring workouts. Keep up the great work! Remember, resolutions are about making permanent changes, not changes that only work for a small while, so try what you think you can really fit into you life and try to stick with it for at least three weeks, as it takes 21 days to form a habit. 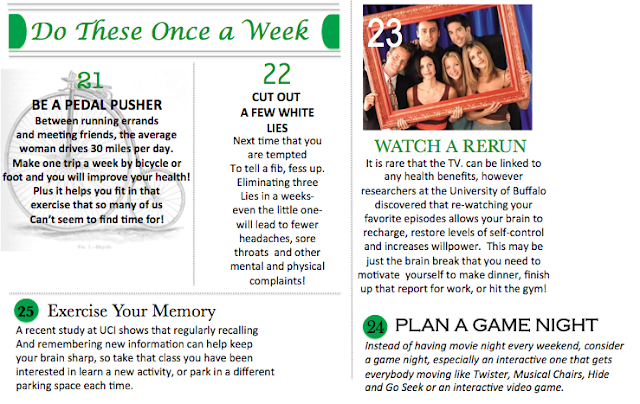 Month two is in full swing for 2013 and what better post than five more resolutions that we should all try to incorporate into or daily routine. This month's post is about five resolutions that I have already started to incorporate and am excited to share with all of you. Hopefully you will want to incorporate these "resolutions" if you will into your daily routine as well! Every year, the conversation about making New Year's Resolution manages to come up amongst family, friends, and loved ones. I am not one for making resolutions that can't be kept, or only sound great during the month of January, and as I continue to evolve through my previous resolutions of year's past, I have also opened myself up to the possibility of making resolutions that start throughout different times of the year. Over the next few weeks, I will be posting some of my "resolutions" that I intend to work on this year and keep for many years to come. Without further ado, here are the first five! I am a firm believer that a clean healthy home results in a happy home. If your home is in order, you will feel more at peace, less stressed, and have a generally cleaner home which leads to fewer microbes, bacteria, and viruses floating around your home. 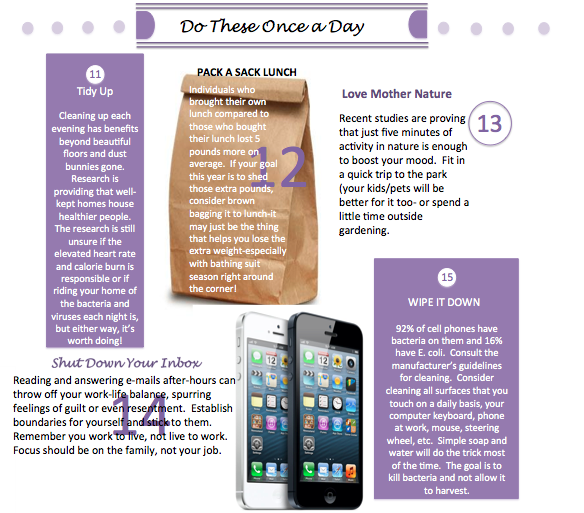 Here are a few tips to keeping your home clean and your family less likely to get sick! Clean bathrooms and kitchen once a week. These are the two areas of the house that are used the most often and harbor the most germs. Be sure to use products that contain bleach to be sure to kill the majority of the viruses, microbes, and/or bacteria that may be living in these areas. Be especially thorough when cleaning the sinks, toilet, and tub/shower; as these are all areas that contain water and all bacteria and mold to thrive. Dust your house once every one to two weeks. The allergens and dust mites do nothing short of aggravate your allergies, so the more often you dust, the less of a chance those pesky allergens and mites will have of getting your allergies-and you irritated. Change your air filter once a month to every three months. Our house is older and therefore, the filter needs to be changed more often. We try to change ours every month (we really notice a huge difference in the amount of dust in our house when it is time to change the filter); however, sometimes time gets away from us, so we change it at least every three months. Changing the filter cuts down on dust, allergens, and mites, which in my family's case is great as we all have sensitive allergies. Vacuum, sweep and mop at least once a week. You walk throughout your house everyday, tracking dirt, germs, and goodness know what else throughout the house. vacuuming, sweeping, and mopping picks all of that up and leaves your house feeling clean and refreshed. I also suggest, if possible not wearing your shoes in the house. Just consider where your shoes have been (schools, public bathrooms, shopping malls, etc.) where cars have driven, people have walked, spit their gum out, and we won't even mention the other possibilities. Do you really want all of that being tracked through your home? When your wear your shoes in your home, that is exactly what you do-YUCK! Clean linens once every two to four weeks. We have heard about bed bugs, dust mites, mildew, and allergens-and they love to live in our fancy towels that hang in the bathroom that no one uses, one the bathmat that we step on, our drapes that cover our windows (if you have them), and of course our bed linens. These all need cleaning too. I simply just gather all of these items together and put them in the washer together. There is nothing better than sleeping on clean sheets and stepping onto a clean bathmat. In regards to the drapes, I suggest just vacuuming or taking them outside and shaking them out so as to avoid shrinking. Polish wood once a month. Polishing the wood furniture in your house not only leaves your furniture looking new and shiny and your house smelling fantastically like lemon, but it moisturizes the wood, which is much needed, and increases the longevity of your furnitures life. De-clutter daily. 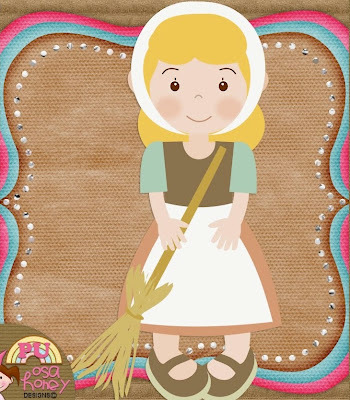 Putting toys, books, mail, dishes, clothes, etc back where they belong at the end of each day allows you to start the following day with a clean slate. You feel more organized, less stressed, and you never wonder where your belongings are since they are always put back into their place each day. So many people think that they need to switch to a gluten-free diet, or a vegan diet, or a sugar-free diet, or whatever the latest, greatest, or newest fad diet of the moment is. The fact of the matter is, like the previous post said, diets aren't key, lifestyle changes are. Today's focus is on grains-the difference between simple and complex carbohydrates. 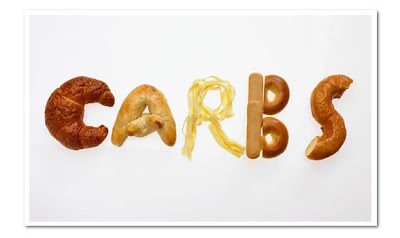 Simple carbohydrates are simple sugars, like candy, fruits, juices, and even white breads and pastas. They are easier to break down and as a result excess energy may be released in your body and if it is not used, it will be stored as fat. Complex carbohydrates are more difficult to break apart and are found in whole wheat products such as whole wheat/grain pasta, bread, flour, etc. These complex carbohydrates are more difficult to break down and as a result require more energy to break down and is likely to be stored as fat since it takes such a long time to break down these complex carbs. Bottom line, when making the choice between whole wheat and enriched white, ALWAYS, choose whole wheat, it is a complex carb, and will be used as energy and will be less likely stored as fat. That means for you carb loaders out there, you can still load up on your carbs, just choose complex, whole wheat and feel less guilty!!! With everyone out there constantly trying to live a healthy life style, it seems that a new diet makes its way to the forefront almost every week. The problem with diets is that they are exactly that-diets. They are temporary changes that cause temporary results. If you are looking for true results, you need to be willing to make LIFESTYLE changes, meaning being willing to make changes to your diet, not try a diet. There is a vast difference between the two. 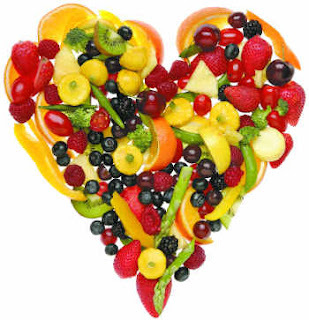 The best idea is to stick to the food pyramid and to try to keep as many natural foods in your diet as possible. In other words, butter is better to eat than margarine, so go ahead and eat it! Just don't eat the entire stick! Also, consider looking for low fat options like low-fat or fat free yogurt, cottage cheese, sour cream, or milk. Moderation is the key to having success in making a lifestyle change, these small changes add up to habits, and habits turn into your success! So, stop saying that you are going to start eating healthy tomorrow, make the change now. Get up, get going, and make those changes; trust me, once you start you will see how easy those little changes are and how much happier you can be! Happy Habit Forming! With the new year finally in full swing, many people have already made-and broken-their new year's resolutions. I think that so many people have lost sight of the point and purpose of what a resolution is supposed to be about. It is intended to be a goal set for yourself, by yourself that is attainable. The only person that is truly disappointed when the resolution is not met is you. This area of my blog will be dedicated to giving tips and/or advice in the above areas that may help you, and hopefully allow you to become a more happy, healthy, and positive you! One of the best things that anyone can do for themselves is to get up, get out, and get exercising! When so many of us see or hear about the term aerobic exercise, we can't help thinking about women from the late 80's and early 90's with their unitards, neon colored socks, scruchi's, huge hair, and Gem-style make-up all lined up in a Jazzercise class! There is more to aerobic exercise than those notorious Jazzercise classes, aerobic exercise is anything that gets your heart rate up into the 60% range for a minimum of 20 minutes-that includes, but is not limited to aerobic classes, spin, running, walking, jogging, swimming, biking, hiking, playing sports, and even (ahem) other activities! I personally detest the hub-bub, regular routine of going to the gym, and staring at the same wall while running in place on a treadmill for 20 minutes. BUT, I love exercise videos that I can do in the comfort of my own home, or getting to hit the pavement on a beautiful day, or even playing a great game of chase with my two-year. Exercise is what you make of it, and no matter how you slice it, getting your heart rate up for at least 20 minutes a day is good for the mind, body, and soul. Exercise has been clinically proven to release endorphins-the 'feel good' hormones-that make us all feel great and accomplished as soon as a work out is over. Exercising also allows you a minimum of 20 minutes of 'me' time where you can work out, listen to whatever music you wish and mentally escape the stressful world that you are a part of each day. If you are just getting started and want to start to exercise but don't want to commit to a gym membership, I suggest a home exercise video. Jillian Michael's 30 Day Shred is a great work out, and the best part is that it is truly 20 minutes from warm up to cool down! If you are look for something a little more intense, P90X and Insanity are both excellent home video workouts! They are a little pricey, and the workouts are closer to 90 minutes each, but they guarantee results and YOU will see results! Otherwise, if you are a self-motivated person, I suggest hitting the pavement, there is nothing like feeling the ground beneath your feel, the wind in your face, and a sense of accomplishment when you see how far you can actually go! No matter what it is that you decide to do, just get out there are start, it doesn't matter how fast, slow, fit, unfit, flexible, stiff, strong or weak you are. It just matters that you are taking a step in the direction of beginning to lead a healthier lifestyle! So get out there and start moving! Easy Pose- This pose is truly easy. All you need to do is sit "criss-cross applesauce," with your hands resting on your knees, palms facing upwards, back straight, with spine in neutral position, and your pelvis in a neutral position and you are ready to begin. All you need to do is inhale through your nose slowly filling both your abdomen and chest (diaphragm and lungs), and slowly exhale through your nose emptying both your diaphragm and lungs as well. This pose can be done for as long as you wish and as often as you want to. The only thing to keep into consideration is how you crossed your legs, and to be sure to alternate. For instance, if the first time your left leg faced out, then the next time, your right leg should face out. This way pressure is always shifted. You will notice that the more often you do this pose, the more relaxed and calm you will feel, so this is a great exercise to do when you are stressed out or can't sleep. Hero Pose- Kneel on the floor with your thighs perpendicular to the floor, and touch your inner knees together. Slide your feet apat, slightly wider than your hips, with the tops of your feet flat on the floor. Angle your big toes slightly inward toward each other and press each foot evenly into the floor. Press your shoulder blades into the back of your ribs and your chest up. Widen your collarbones and release your shoulder blades away from your ears. Lengthen your tailbone into the floor. When first doing this pose, try to hold it for 30 seconds to 1 minute, and gradually work your way up to 5 minutes. You can do this as often as everyday of the week. This is a great pose to do if you are feeling sleepy and need a quick pick-me-up. Downward Dog- Get on to the floor on your hands and knees. Set your hands and knees directly below your hips, slightly forward of your shoulders. Spread your palms with your index fingers parellel or slightly turned out and your toes under. Take a deep breath in, and on the exhale, lift your knees away from the floor, keeping knees slightly bent with heels lifted away from the floor. Lengthen your tailbone away from the back of your pelvis and press it lightly toward the pubis. Against the resistance, lift your bottom (sitting bones) towards the ceiling, and from your inner ankles draw the inner legs up into the groins. Inhale again. Then on this exhale, push your tops thighs back and stretch your heels down toward the floor. Straighten your knees, but do not lock them. Firm your outer thighs and roll the upper thighs inward slightly. Inhale again, and with this exhale firm your arms and press them into the floor. Inhale again, and with this exhale, hold the pose, keeping all muscles firm and pressing into the floor, making sure not to lose the position. As you are ready to come out of the pose, you will do the reverse on every exhale. Child's Pose- Sit on your knees making your shins and thighs parellel to one another. Inhale in, and on the exhale, bend your torso to be parellel with your thighs and shins and relax your arms next to your legs, with your palms facing forward next to your feet. Breathe in and out through your nose for many controlled breaths, and remain in this position for about 1 minute. Always do this position after you have completed the Downward Dog. Chair Pose- Standing in upright position, on an exhale, lift arms up high, bend knees, keeping pelvis in neutral position. With each breath expand abdomen and chest breathing in and out through your nose. Hold this pose for 30 seconds to one minute. For more advanced yoggies, try to go deeper into the pose with each exhale. If you are interested in creating your own at home yoga program, with tutorials, blogs, forums, and much more, the click here, it is actually where I went to get all of these great images.